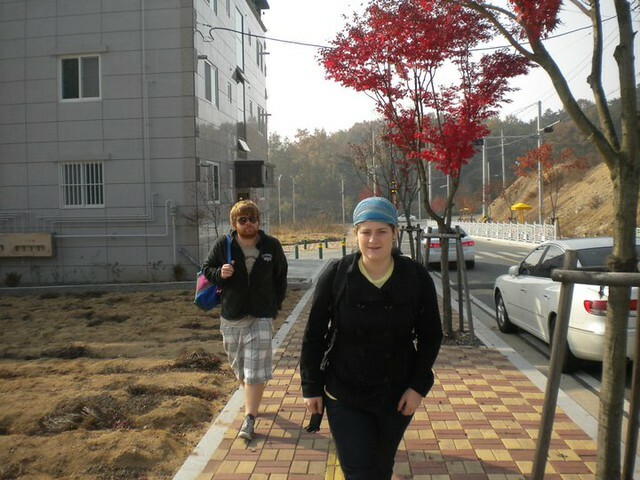 On a weekend in early November, I traveled to Andong with my Ulsan friend Paul to visit some friends from our EPIK orientation. 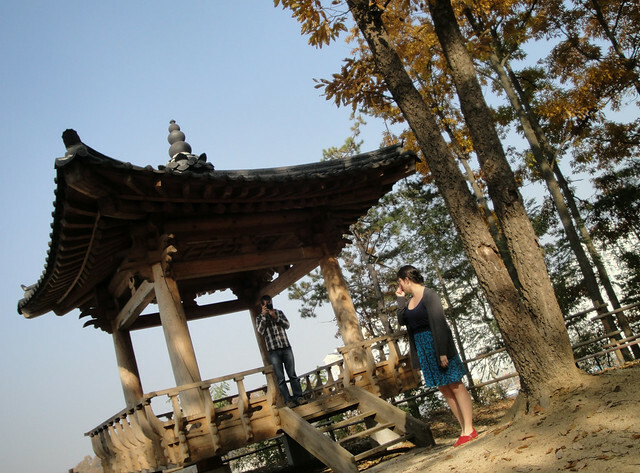 Andong is famous for its traditional folk village, folk museum, and annual mask festival. While we didn’t take in any traditional Korean culture on our visit, we did take in a lot of fall colors and fruit makgeolli. …where we posed for our future K-pop album cover. 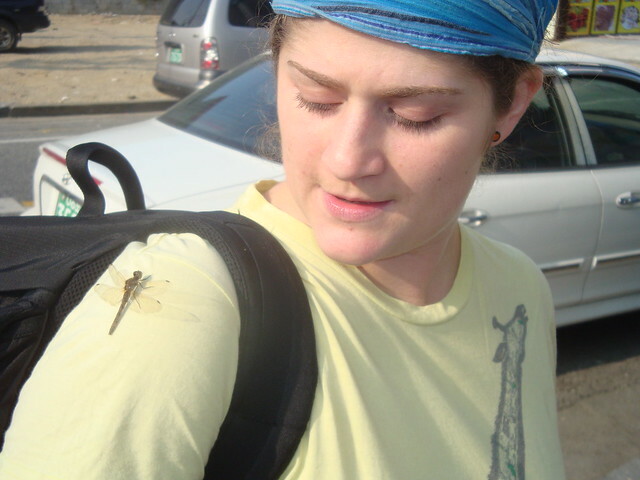 Sharing a moment with a dragonfly. 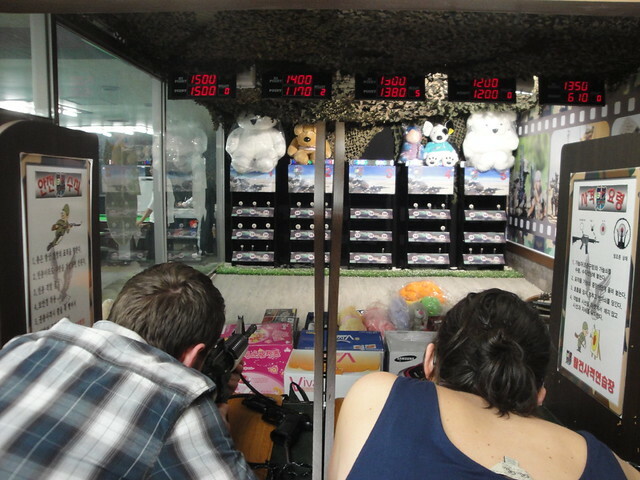 Ulsan doesn’t have any wildlife, so this was pretty exciting. Apologies to my sister for stealing her headband and taking it to Korea. The highlight of the weekend, for me, was my first trip to a DVD Bang. For those unfamiliar with DVD rooms (bang = room, pronounced bahng), they’re places where you can go with a few friends to pick out a DVD and watch in your own private viewing room. The rooms generally come equipped with a large flat screen (or, if you’re lucky, a projector), surround sound, and some couch-like seating that can fit 2-4 people. And, not to be a nerdy film school student, but the good ones provide a pretty awesome cinematic experience, as I discovered watching Paranormal Activity in Andong with a truly all-encompassing sound system that gave new meaning to the term ‘surround’ sound. But first, one point must be addressed: In Korea, DVD bangs have a certain reputation. Most people aren’t going there just to watch movies. They’re very popular with young Koreans looking to get away from their parents for a few hours for some ‘alone time’ with their special someone. With this bit of information in the back of your mind, it can be a bit difficult to get completely comfy on the bed-like couches and pillows the place provides (and probably never washes). Checking into a room with more than one friend can get you some weird looks from the guy behind the counter. Telling your co-teacher you went to a DVD bang over the weekend will get you the same weird looks, and some snickers. That evening we opted for Paranormal Activity, which three of us had somehow never seen. And the reason this is blog-worthy is because of how awesome it was to watch Paranormal Activity at this particular DVD Bang in downtown Andong. First of all, it was a small, completely black room, just large enough to fit all four of us comfortably on the reclined, bed-like couch. A projector filled the opposite wall of the room with the image. And the surround sound was so all-encompassing that the subwoofer was in the couch. This probably doesn’t sound like a big deal, but the effect it created so enhanced the viewing experience I’m going to elaborate on it more. The sub-woofer only kicked in at the scary parts, like every evening when the couple went to bed, and it created an ominous rumbling vibration underneath us. Every loud noise was accompanied by a shake from the couch. It certainly enhanced the suspense and scares, and kind of reminded me of being in that Alien movie ride/experience in Disney World. I have since been to other DVD bangs, but this has been the only one with sub-woofer-laced seating. And as they can be kind of expensive (4-6,000 won per person, which is about $4-6 USD), it doesn’t really seem worth it…unless you really need somewhere to get away for a few hours. But if you’re ever in Andong and in the mood for something scary, this DVD bang is highly recommended. Besides the DVD bang, downtown Andong was pretty cool. Amongst the expected bars, restaurants and convenience stores was a BB gun shooting range, outdoor batting cages, and small outdoor arcade. I’ve since discovered these things in the eastern part of Ulsan and a few other cities, so I guess they’re not uncommon. 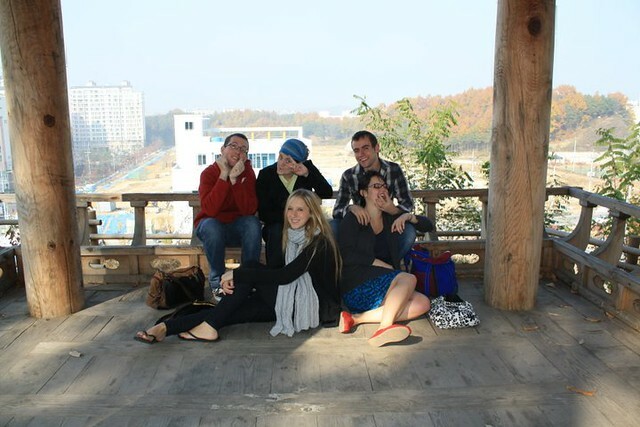 The teaching situation of my friends Ellen and Savannah in Andong is unusual for EPIK, the program that brings many of us English teachers to Korea. Generally EPIK places foreign teachers in a public school, where you teach with a Korean co-teacher. They weren’t placed in a public school, however, but a “research institute.” Upon our arrival in October, the research institute wasn’t quite ready (how ‘Korea’), so they taught third grade for a few months. Now that they’ve moved into the research institute, they each have a tiny cubicle-sized office with a computer where they give private lessons to students over the internet 1-9pm every day. It’s not really what they signed up for when they thought they were coming to Korea to work in a classroom, but applying through EPIK you don’t really have any control of where you’re placed. It sounds like their new situation is growing on them, but just a word of warning for anyone who may read this and consider coming over to be an English teacher (not that you’d have the chance for much longer, anyways). Andong is a much smaller city than Ulsan (it’s pop is 184,0000) and so the network of English teachers seems pretty close-knit. My friends live in a brand new building in a brand new, just-being-developed part of the city, with a bunch of other teachers who work at the same research institute. It felt a bit like being back in the dorms, but everyone has their own bathroom. And heated floors.